I have no idea what your administration skills are. Mine date officially back to mid 2000 although I have setup recently servers but then mainly for development purposes only. 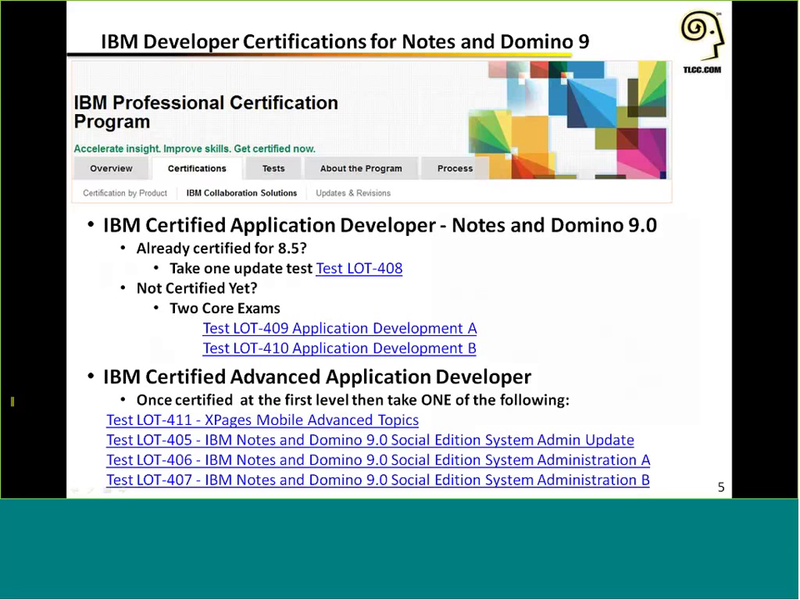 So if you want your skills and insights updated like I do or you perhaps a tip for you could be to order the IBM Lotus Domino Administration 8.5.3 Training at Udemy. Untill 1 November there is a give away action running to buy courses for 10 euro if you provide the coupon UDEMY10OCT. Okay, it is targetted for 8.5.3 but how much has changed between 8.5.3 and 9.0.1? I have no idea about the quality of the course, I guess you have to find out yourself. For 10 euro: what are your alternatives? Last week I had the pleasure to attend Engage, the yearly event for the BeNeLux user-group around IBM’s collaboration portfolio. Indeed it was a pleasure, due to the efforts of Theo Heselmans and his team, the sponsors, the location and of course the participants. Much appreciated! No user-groups without users! Before the event I read a tweet of someone wishing all attendees at Engage good luck with finding IBM’s roadmap for Domino. I took this tweet with me in mind to the event. I will not review each individual session but just let my thoughts run around things heard from speakers, attendees and IBM-ers. The new general manager for IBM Collaboration Solutions gave a fresh impression and her perspective on collaboration. I am not sure how good and bad this is for the products in her portfolio and time will tell. All the brag about project Toscana, the interpretation of Slack by IBM for me is just a bit painful. It gives me the impression that the distance between IBM Labs and the product managers in ICS have just grown through the years and makes me wonder who is holding the prophetic views within ICS? I also talked with an IBM salesperson and my frustration with IBM Connections and trying to integrate applications with it was down-played as ‘not knowing how to use the platform to it’s full potential’ and ‘is providing links to these applications not sufficient’? Why may I not use my collaboration tools in the way I would like to and not confirm to the limitations/restrictions the manufacturer tells me to? Sometimes I wish that IBM would train their sales personnel with the help of Watson, or something. In the meantime is was directed to TimeToAct and their web content tool for Connections. I like the concept of graph data modelling where you ‘on the fly’ bind objects together via relationships. In a recent project we established something similar, but than specifying these relations in Notes documents and load them whenever an object was loaded. The major problem is that there is just 1 level depth of relationships, so advanced computations like ‘related’, ‘mentions’, ‘similar or most in common objects’ were not possible. Having digged through Oliver Busse’s example and Nathan’s presentation I see the potential of Graph with Notes data and I frankly do NOT understand why IBM is not assisting the OpenNTF Domino API team to get the Graph feature available in Extension Library as from TODAY. Graph capabilities would be a good argument for customers to keep their data in Notes (for now) and in the meantime give them the opportunity to understand and explore the (new) opportunities Graph can bring to the platform. Perhaps these customers remain dedicated to the Notes platform! But perhaps involvement of IBM would slow down the ODA team when hearing the comment on project Toscana “only IBM would brag for two days for a feature that requires 15 minutes of coding”. Nevertheless it hurts to read tweets from IT managers how wonderful Microsoft’s Office Graph is while IBM has nothing to offer to us. And then there was Bluemix, IBM’s hybrid cloud development platform where Xpages and Notes NoSQL database are recently available. Recently I moved a Teamroom application to Bluemix which took me a bit more time than expected due to the architecture of the application. John Jardin demonstrated some entertaining examples of services on Bluemix that can bring new functionality to Xpages applications. Definitely a cool area to explore new paradigms and technologies. Mark Leusink held a nice introduction to Ionic, a hybrid mobile app framework. For me mobile development never came from the ground, mainly because lack of demand. Delivering an XPages app with responsive behaviour, capturing touch gestures and more bells and whistles did not feel like mobile development. You simple need access to and use native services to capture a mobile application full potential. Aah XPages, my comfort zone. Too bad no stories or demonstrations of highly complex or smart solutions build on XPages on the conference. Niklas Heidloff‘s to have the option to have a Node.js server on Domino with capabilities to access NSF’s via Domino Access Services would be a nice option to deliver full CSJS solutions and attract a different (new) audience of developers. Being able to develop similar applications but then on Node instead of XPages and hereby following the trends in web application development would be something I would favour. Even if that would mean to be forced to cast away all that XPages knowledge. During the days I have spoken with developers who were irritated by lack of roadmap for XPages. I have to admit hearing Peter Janzen talking about Domino App Dev futures were giving me flashbacks to his presentation in 2015 at IBMConnect. I am not sure how big encryption is for web development. Bootstrap we take for granted nowadays. How can we integrate Domino into Connections? And (again) when can we have Graph capabilities? Coming back on the tweet mentioned in the introduction. So did I find the roadmap for Domino? It was not said where the data for project Toscana, IBM’s late adaption of Slack, would reside. Verse is (partly I guess) on Domino. During a round table discussion with Peter Janzen about Domino App dev concerns where made by developers to have a modern Designer, preferably as a plugin in Eclipse. Peter mentioned that the Forms and View (probably also the Agents) design elements hinders IBM to move in such direction. Having worked with now with Spring Tools Suite some parts of Domino Designer are a crime (source control, build automation). Being able to develop inline with most other web development projects like Keith Strickland demonstrated is in the benefit of Domino developers and of the Domino platform. So excuse me for not finding this roadmap. The best thing about a user-group conference is being able to talk with users and share thoughts. And a have drink and go out for dinner. I like to thank everyone I met. So this brings me to the conclusion that after having attended the conference I probably have as much (different) questions as I had before. Nevertheless I had a nice time with my fellow “experts in the field”. 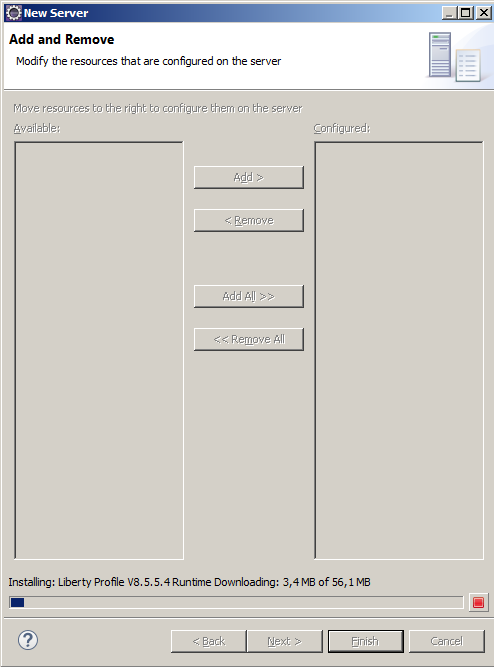 I am trying to run a lab to install a custom app in connections cloud. 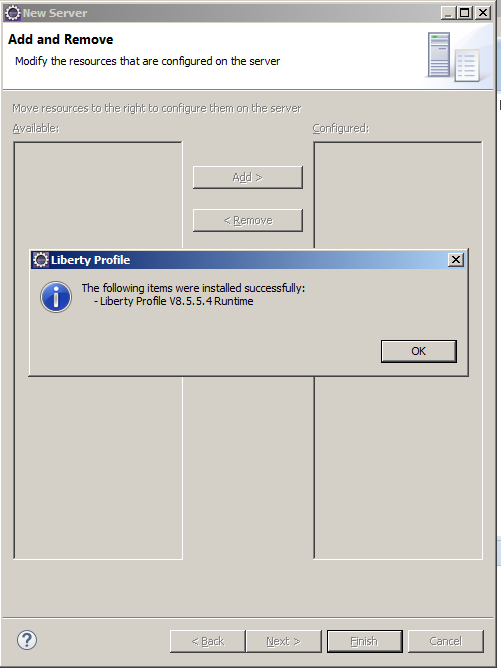 Only I have a problem with Eclipse and installing a local Liberty server. 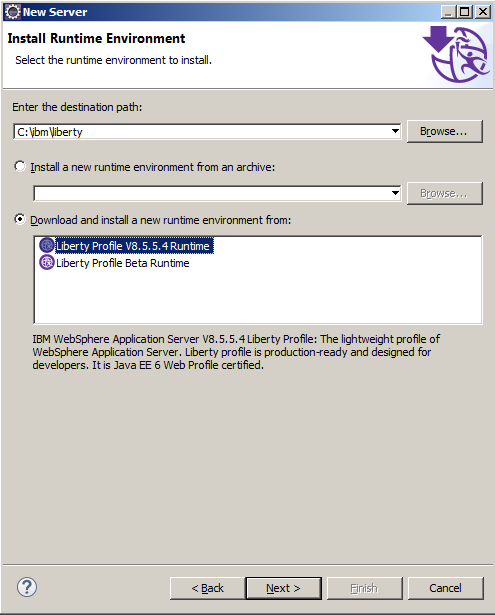 For another project I performed the Liberty installation earlier. Piece of cake! 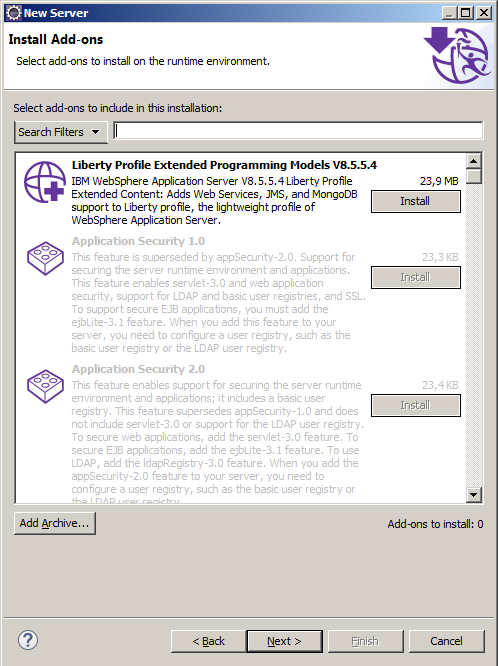 But for this project I started with a clean sheet: re-installed Eclipse and when I choose to install Liberty server from a repository Eclipse (Lunar 4.4.1) simply collapses. 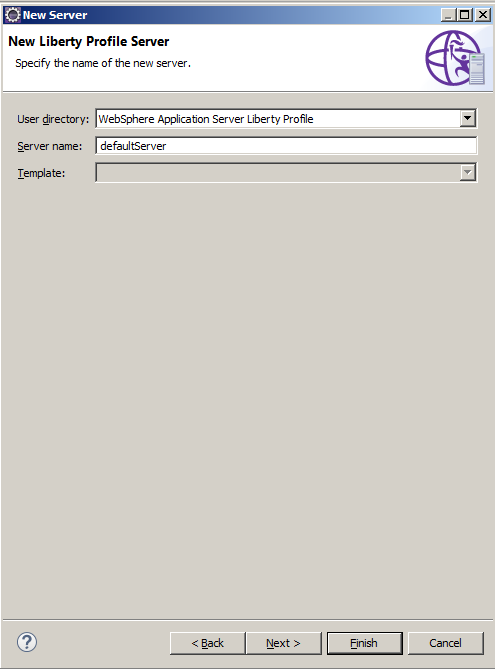 As a check I installed Eclipse and a Liberty server on a clean OS and I do not have the same problems there. Do you recognize this? *crying* I never get to this next step. 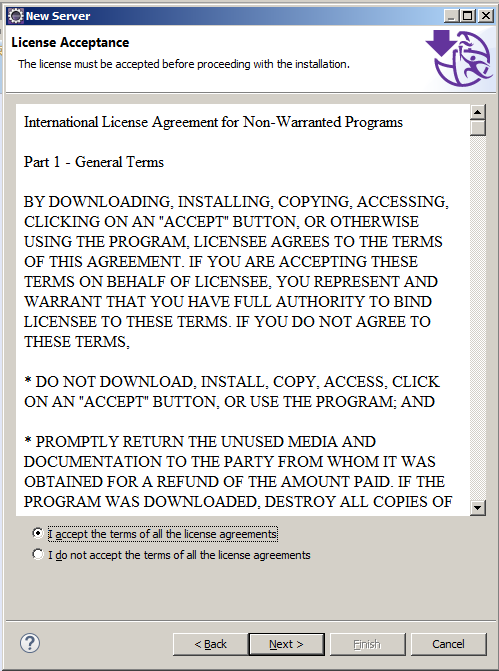 This second exam was much more focused on development with XPages, using the Extension Library and the Mobile controls. I guess according what you would expect in modern Domino development. There were the ooccasional LotusScript and @Formula questions, but the majority of the questions were XPages related. Personally I find the setup a bit odd. I Hardly use @Formula or LotusScript in new projects. I wonder why IBM is not defining exams within each technical area seperately e.g. XPages, @Formula & Functions, LotusScript, Java and Extension Library if you wish. Overall I liked the second exam better, no odd questions about Notes client installation, parameters in the client, more practical development questions. But also expect questions on JSF, XSP configuration etcetera. I have not considered to upgrade my certification to the ‘Advanced’ level since I have not worked with administration so intensively lately. I expect though that the XPages mobile advanced topics would be a “piece of cake”. What are your experiences? After all it is also a financial question because the exams are not free. Maybe there will be the option to take an exam on IBM ConnectED 2015? Last week I attended the Softlayer Fundamentals Infrastructure-As-A-Service (IaaS) course in Stockholm. The SoftLayer Fundamentals instructor-led training course introduces SoftLayer Infrastructure-as-a-Solution (IaaS) solutions through instruction and hands-on activities. The course provides learners with the basic fundamentals to become more proficient in SoftLayer and empowers them to make informed decisions about IaaS solutions based on business requirements. First the course was led by Susy Gottberg and she is a great presenter. For a present developer / former administrator it was interesting to be educated on NAS, SAN, CPU’s, memories, routers, data storage, virtualization, firewalls, antivirus and what SL has got to offer here. Overall I am very impressed. I decided last minute to take usage of the early bird rate for IBM ConnectED. Since the event has this time more focus on technical content and a pre-release of Mail Next I have a feeling this edition will be of great value. Hope to CU in Orlando! I think I have made all arrangements to attend the upcoming Icon UK event. Looking forward to this event and I hope to C U there! Funny, but a motive when moving to Sweden was to combine work with a bit of holiday. Recently I signed up for the Engage event and will do it the other way around in the Netherlands: combine holiday with a bit of work. I am looking forward to the event because of it’s great line-up. I am curious how the ‘collaboration market’ nowadays looks like in the Netherlands and Belgium and what the opportunities are.